In 1950s Chicago, a boy hides in his closet to escape a father's habitual rage. There he conjures up another paternal figure in his artistic Italian grandfather, Canio Grieco. With his wondrous tricks and stories of "Italy," his library and drawings, his baseball and opera, Canio becomes the model of creativity for the lonely, introverted grandson who learns to survive through ingenuity, imagination, and electricity. Canio's Secret is a coming-of-age story about young Greg's struggle to find solace in his mother's Catholicism and break free of his father's anger. Told through intimate portraits of parents and grandparents, nuns and janitors, friends and local characters, and their unsettling, often humorous, encounters, it is also the vibrant portrait of a multi-ethnic neighborhood soon to be scattered by white flight. 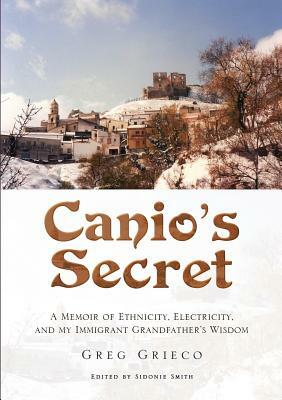 As the older writer ponders his grandfather's influence, the memoir becomes a meditation on Canio's enigmatic advice, spoken in the summer of 1953: "Happiness is all that's required.